Dwan vs Antonius - Who Has The Edge? In case you haven't heard, the much-hyped Tom Dwan vs Patrik Antonius battle finally got underway earlier this morning. This is the first match of the "durrrr" challenge - apparently other players, including Phil Ivey and David Benyamine, are waiting patiently for their shot at Dwan once ths current battle ends. EVERYONE is talking about this battle. Many sites are devoting full sections to covering this epic online poker battle. Even Full Tilt Poker has a page devoted to hyping this battle, and they even took the extra step of opening up EIGHT new tables specifically for the "durrrr" challenge. Why is this battle so big? 1. 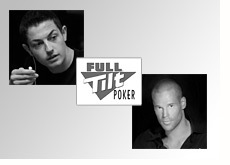 It involves two of the biggest names in the poker world. On one side you have Tom "durrrr" Dwan, a young poker prodigy who has built up an eight-figure bankroll playing almost exclusively online. On the other side you have Patrik Antonius, the charismatic Finnish player who has been crushing the biggest games for years. I would venture to say that Dwan and Antonius are easily two of the top five most searched poker players in the world, along with Phil Ivey, Daniel Negreanu and Phil Hellmuth. 2. The match has been hyped for months. I mean really - this has been skillfully promoted. First you had the "leaked" Dwan challenge. Then you had the question of who would accept the challenge. Then you had the various players publicly accepting the challenge. Then you had the weeks of build-up as Antonius and Dwan cleared their schedules in order to fully devote themselves to the challenge. Full Tilt Poker then started promoting the challenge on their site, and ended up creating eight new tables specifically for the challenge. Finally, Dwan and Antonius seemed to be unable to find a time to play, until they finally started their contest early this morning. The build-up to the starting of the challenge has been insane, but finally it has gotten underway. Who will win this challenge? Is Phil Ivey next in line? Will Dwan want to play again after he battles with Antonius, or will he decide that this was his first and only challenge match? Most people that I have talked to have picked Dwan to win this match-up - I would say that it's about 60/40 in favor of Dwan. Dwan isn't stupid - he knows that he has an edge when it comes to playing 4+ tables at once. That is why he included this stipulation - if the contest were just one table at a time, then Dwan's edge would disappear. One thing is for sure - nothing has fired up the online poker masses like this for a long, long time.